2. Visit the New England Aquarium, so you feel like being in the ocean, and a variety of sea creatures swim underwater world. 3. Acadia National Park the vocation land of the 19th century American tycoons: John D. Rockefeller family, Andrew Carnegie and JP Morgan’s. We are leaving from Manhattan and Flushing, crossing the first two states in New England Region: Connecticut and Massachusetts, then we arrive in the cradle of American history - Boston, we take the Boston Harbor Cruise in the Boston's oldest pier, we recall the Boston Tea Party event before the Revolutionary War in 1700's, the boat take us to visit the first shipbuilding factories and military bases: Charlestown Navy Yard, and the America's oldest naval warship: "The USS Constitution." Next, visit the New England Aquarium, which opened in 1969, is a global leader in ocean exploration and marine conservation. The Aquarium is one of the premier visitor attractions in Boston, with over 1.3 million visitors a year, and a major public education resource. With four-story Giant Ocean Tank features a brand new coral reef, an underwater communications system, large windows and hundreds of Caribbean reef animals, including sea turtles, stingrays, eels and fish the exhibit goes down 26 feet, it is 40 feet wide and holds 200,000 gallons of salt water. 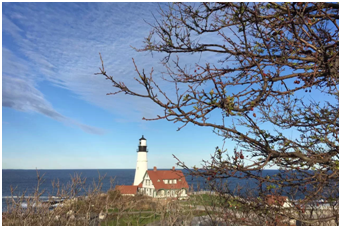 Finally, if we move to the fourth largest city in Maine - Portland, enjoy one of the oldest, most beautiful, the nation's highest photography light house: Portland Headlight house. 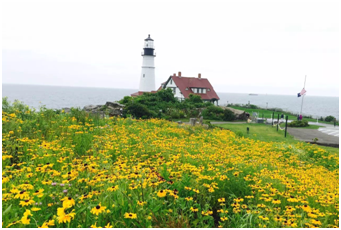 The lighthouse was first authorized built by the first president of the United States; George Washington in 1787, which faces to the Atlantic Ocean, visitors can shoot from all angles of the lighthouse. And the lighthouse still is in use in the present. 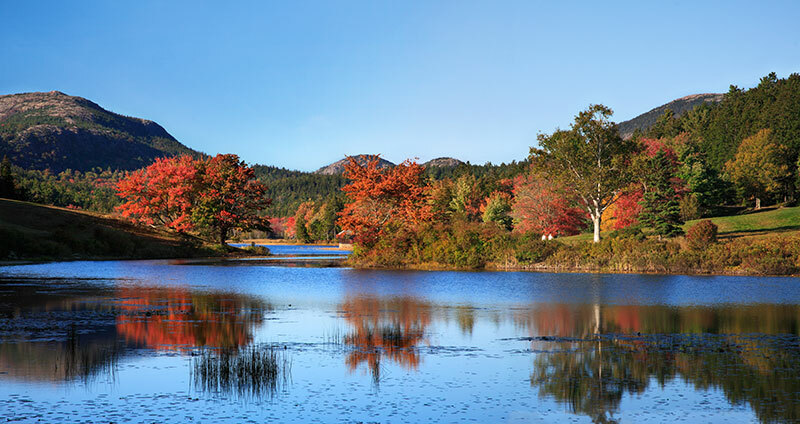 In the early morning, we drive up to the Acadia National Park; the Maine's most northeastern region .The park is the vocation land of the 19th century American tycoons: John D. Rockefeller family, Andrew Carnegie and JP Morgan’s. The U.S. President Barack Obama and his family spent three wonderful days here in 2010. 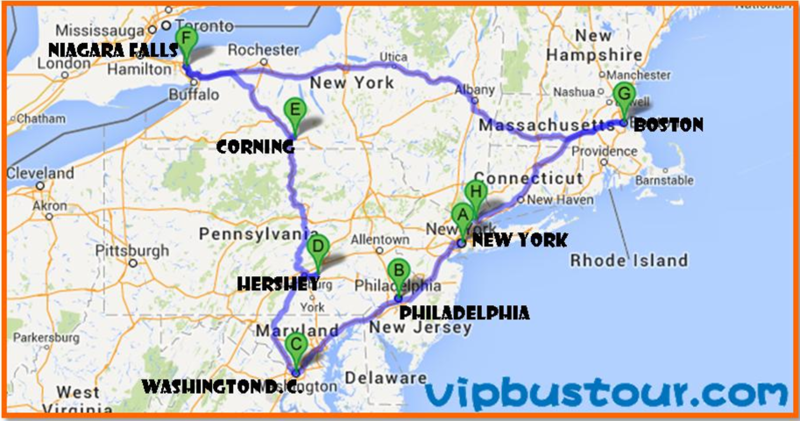 Then we visit the tallest mountains along the Mount. Desert Island, where is the earliest to see the sunrise and sunset on the top of Cadillac Mountain. 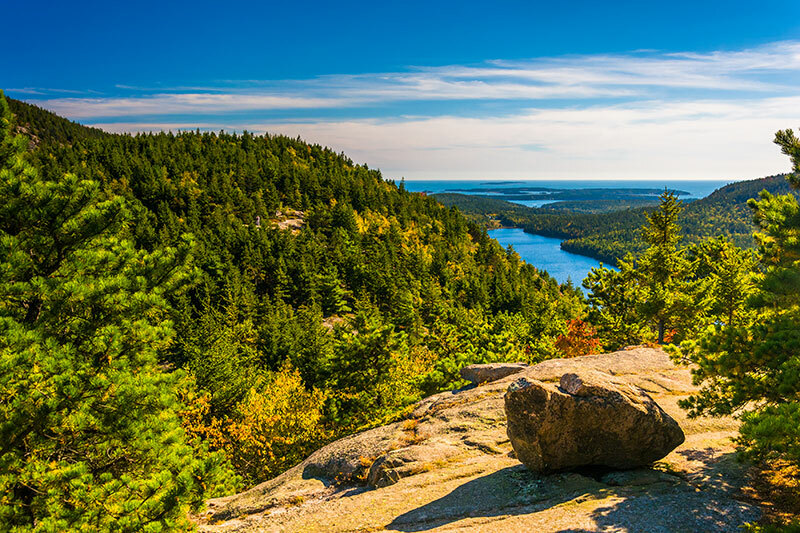 The Cadillac Mountain is formed millions of years ago through the formation of crustal movement and cooling pink granite. 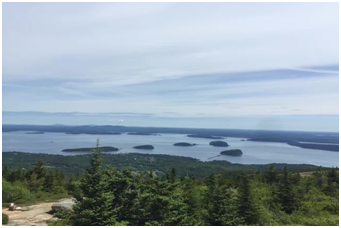 Along the way we can enjoy a very nice view of Eagle Lake, then we reach up the summit, we can see up to 60 islands scattered in the spectacular views of the Atlantic Ocean, we are really feeling Maine father, mother earth and ocean romance darling generated. At noon we are down to the local oldest Baltic seaport : Bar Harbor , it is a more than 150 year old fishing village, we are fortunate to try the most famous French steamed Maine lobster, lobster ice cream, blueberry soda, blueberry ice cream, lobster ice cream and blueberry pie. 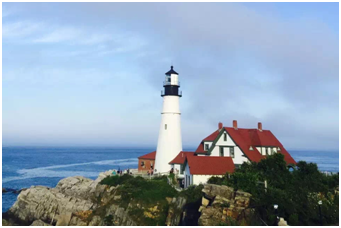 Later, we take the Nature Cruise or local ecological lobster boats, learning about the local wild marine animals, including harbor seals, bald eagle the national bird of the United States, sea ducks, and other wild animals; we also can learn about Maine lobster habits and know the local fishermen catch lobster process. We also pass by the sand beach and thunder hole. 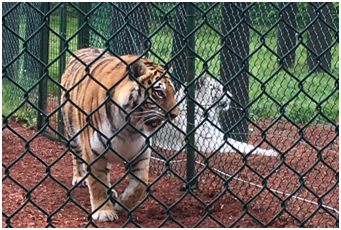 We drive to the York's Wild Kingdom Zoo, where the largest animal parks and amusement is park in Maine. It shows the very rare white tigers in India, the world's largest rodent capybara, African zebras and lions, kangaroos in Australia, peacocks from India. There are more than 20 kinds of apes animals. We are free to feed the deer in Maine and small goat; we can ride the camel, too. It is ideal for children and parents to interact with animals and nature. 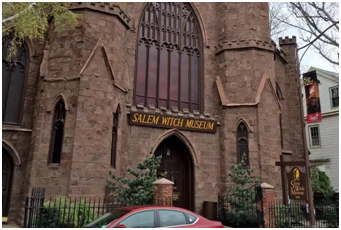 In the afternoon, we arrive to the oldest town in Massachusetts, Salem which established in 1626, we are to visit the Salem Witch Museum, we learn the famous witches hall with a vivid demonstration of simple reproduction of the 17th-century Puritan life scenarios, it tells the stories with vivid language and superb performing arts, where we recall that the people's awareness of the disease and dependence on superstition. The museum offers free Chinese, Japanese, German, Russian, Italian, French, Spanish headphones. Return to New York City at night.